Based on the ISO 19100 Standard, AED-SICAD offers the innovative LM Product Suite. Based on UML modelling according to ISO 19103, specific software solutions are created nearly fully automatically through AED-SICAD’s technology of Model Driven Architecture (MDA). During this process, the following is created: (1) A schema for the geodatabase, (2) a programming interface, which is integrated directly into these components via generic tools, (3) a catalog, which controls the GUI and (4) an XML schema file (XSD), which manages all data exchange. On this basis, the LM Product Suite provides tools for all public sector tasks, starting with the mobile data capture, up to the geodata marketing and sales in the web. All LM products are based on the ArcGIS platform from Esri with its manifold possibilities of mobile use via desktop and server solutions up to the cloud, either public, private or hybrid. The development, marketing and sales of the LM Product Suite is done in close collaboration with Esri and further business partners. The LM Editor offers the complete functionality for the collection, editing, and quality check of geodata of geodata modelled in UML. Additionally, optional components, e.g. for surveying calculation, for homogenization, or for generalization are available. 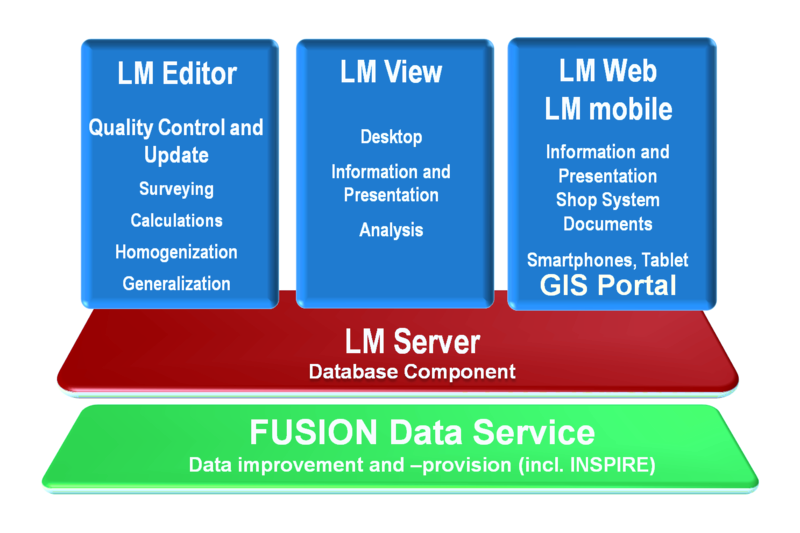 The LM Server serves for the data storage of all modelled information in the geodatabase. The LM Server offers the complectionality for the maintenance, qualification (data checks), and use of data. The data exchange is done conform to GML in a derived XML schema file (XSD). The product LM View is drafted for the use and analysis of data in a desktop seat as an extension to ArcGIS for Desktop. It allows the read-only data access to the modelled data, which are stored in a geodatabase. Through the combined use of other technical applications based on ArcGIS, the user receives a comprehensive and efficient GIS. The product group LM Web & GeoShop allows the information dissemination and making available of data within the Intranet or the Internet. Besides map services, a comfortable navigation, and the querying of the data, you also have the possibility to order and have delivered geodata and products conveniently via the integrated shop system. With LM mobile the different mobile devices such as smartphones, tablets, PCs with touch screens but also classic desktops / laptops may be used efficiently due to the responsive design used. Using the FUSION Data Service you may transform nearly any data format or structure. With this, users or systems, which may not be able to work directly with standard data products, may be enabled very easily. This way, they may use also standard formats such as DXF, Shape or GeoTIFF in their daily work.